JoJo — Nicole & Co.
I’m Nicole, and this right here is JoJo. Or Joey, as we also call him. And this little man is the reason the JoJo exists. Adam and I prayed for a long time for a family, me especially. I dreamt of being a mom and a biz boss my entire life. Luckily for me, biz bossing came charging into my life in my early twenties and hasn’t subsided since. Joey, on the other hand, didn’t make his appearance until about 7 years later. By the time JoJo became an addition to our chaos of a life, we knew he, and we, were in for a wild ride. You see, Adam and I are both business owners. Adam, an outdoorsman through and through, is a hunting and fishing guide. Me, well, I am a designer by nature and a writer by heart. Between the two of us, we own a total of 4 different businesses, from the outdoor world to the graphic design world to the blogger world to the world of the JoJo. Which is most likely why you are here. The JoJo was designed out of pure necessity. Joey, unlike (or similar to, you decide…) most newborns was a hard one to get comfy. Meaning – naps and restful sleep were a no go for ALL OF US. And as business owners and a family with an incredibly active lifestyle, restless-resting was not something that we wanted for our baby. Or us. At the risk of going broke, we ran the gamut of every newborn product out there in an effort to get the baby to sleep restfully. Swings. Pillows. Swaddles. Bassinets. You name it. We tried it. Aside from babywearing, which is how we got through almost all our days until he was too old to carry that way, Joey, and us, could not get restful, satisfying sleep. After watching Joey grow into a great sleeper in his toddler years, and after watching every single one of our friends struggle with the same battle, we decided to create a better way. Something to comfort baby that didn’t inherently create dependence. Something that was as natural to lay in for a toddler as it is for a newborn. Something to hold them while they rested awake AND something to soothe them while they restfully slept. Something that would help them through their startle reflex. Something that would keep them safe and parents unworried. Something that was portable, pretty and pristine. Something that could be used on the floor, on the bed, on the plane. And though there were products that fit some of this, nothing fit it all. And minimalistic families unite – we don’t want to buy ANOTHER thing. One evening, Adam and I sketched up what we thought would satisfy all these things, and contacted a friend that could help us get a prototype made. And Lord behold, IT WAS PERFECT. This is Val, by the way. She's an avid JoJo sleeper and cutest doll of a baby we ever did know. Also, her mom is cool. Joey crawled into it on the floor in the living room and rested, awake, while we stared in awe. We took it over to my best friend with a 2 week old baby girl, who hadn’t slept in weeks, and rejoiced as she slept through the night the very first night. We watched as our girlfriends bickered over who got to take the one and only JoJo on which night, because they needed sleep the most. One JoJo, obviously, was not enough. 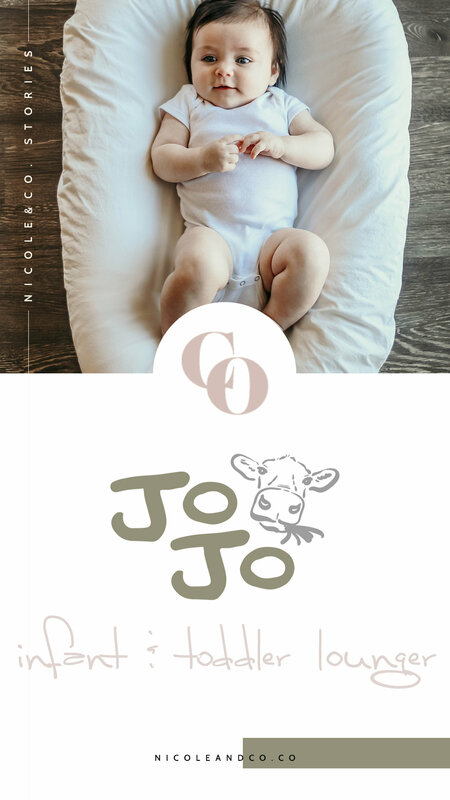 We are so excited to get the JoJo toddler and infant lounger into the hands of every active and tired family in the world, who knows that there is a better way to rest. We believe that rest means more than sleep. We believe in restful sleep and restful rest. Like us, babies need a place to seek comfort, solace and recognition in order to get rest. We, as adults, like our beds or our sofas or the arms of our loved ones. Babies, of course, love our arms. But a rested family is a happy family. And we all need restful sleep. The JoJo is a lounger made for children and parents who are seeking restful sleep. Made for baby, the JoJo comforts and relaxes baby by providing a familiar and tranquil environment for baby to sleep. Its barely padded center makes it incredibly safe but also incredibly comfortable, no matter the surface underneath. Its raised and padded perimeter prevents rolling for infants and keeps baby in place. The egg shape allows the JoJo to be used for babies as small as newborns or as big as toddlers. Made to be used as long as baby needs. Predictable and routine sleep environments are not always available. The JoJo provides a familiar and serene rest environment for baby, anywhere, anytime. Keep the lifestyle, but don’t lose the sleep.